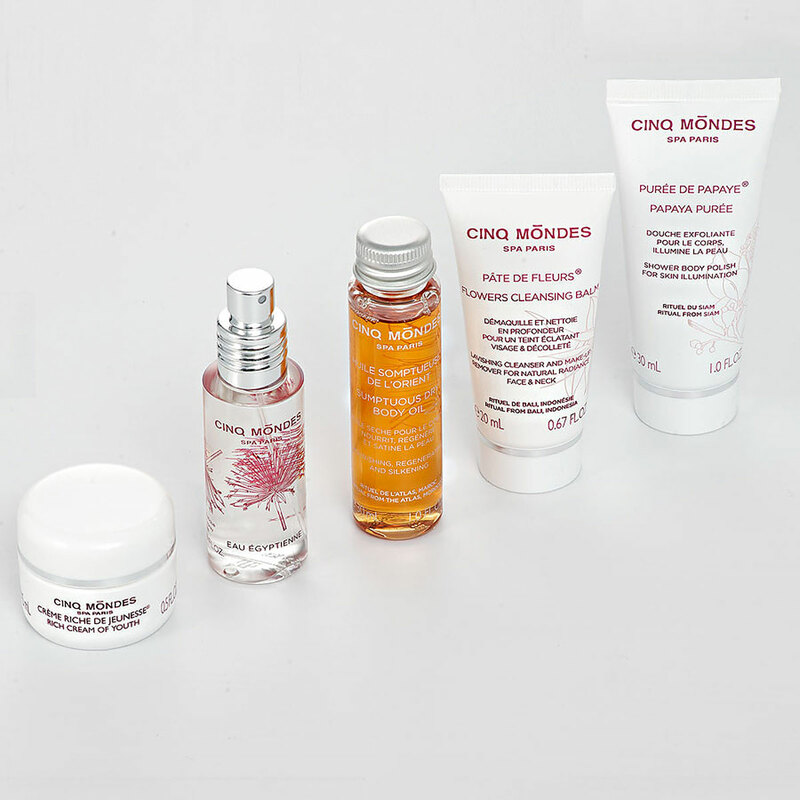 Discover this exclusive selection of Cinq Mondes Must-Have products in a pretty purple and gold bag. Popular for their original and subtle fragrance, unique texture and effectiveness, these 5 products have today become THE iconic essentials inspired by time-honored traditions from around the world. The selection of beauty products is combined with a lovely bouquet of flowers that will put a smile on her face. Discover the secrets of Balinese princesses to boost skin radiance using our legendary makeup remover and cleanser with its melting texture and addictive fragrance of lemongrass and cardamom – avoid the eye contour. Adopt the beauty rituals that Chinese women use to preserve skin youthfulness with subtly perfumed and delicate Rich Cream of Youth. Smoothing and plumping, anti-wrinkle moisturizing cream with UV filter – avoid the eye contour. Enjoy a shower experience perfumed by fragrances from Thailand with Papaya Purée that cleanses, gently exfoliates and delicately brightens the skin. Use in your daily shower and savor a moment of sensorial bliss. Discover subtle and enveloping fragrances from the Atlas Mountains with Sumptuous Dry Body Oil. Our skin-nourishing, regenerative dry oil combines the beneficial effects of Argan and Olive Oils. Embark on a mystical voyage thanks to the secrets of Pharaoh Queen Hatshepsut, her perfumed potion and its power to brighten dreams with Eau Egyptienne, reinterpreted by renowned perfumer Olivia Giacobetti. An iconic fresh aromatic spray with bewitching fragrance for body – hair – pillow mist.